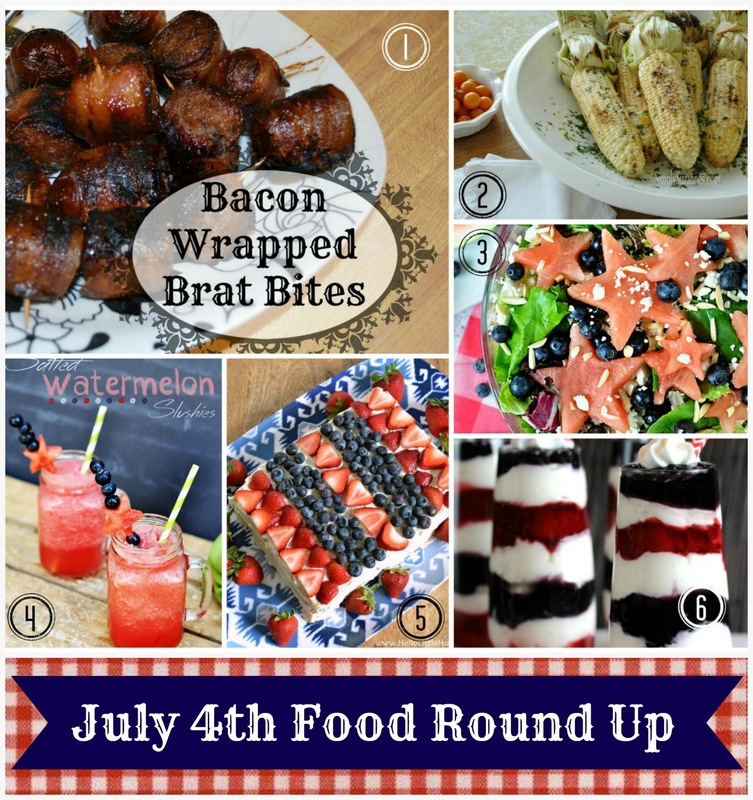 Independence Day is just under a week away, but there's still time to enjoy a little DIY for the occasion. 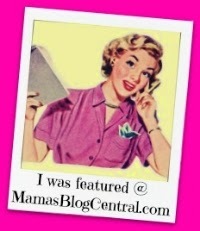 We've rounded up a few great ideas bloggers have shared over the last few weeks. There are so many wonderful things people are doing! I really like July 4th decor that feels old - more subtle colonial colors that hark back to he original Independence Day. These are a few projects that I really love. I adore this project! Faded Old Glory makes for the perfect focal point in this attic bedroom. Old book pages, food coloring and some ribbon come together in this shabby chic wreath. I am such a sucker for needlework, and this sweet little piece makes a lovely tuck-in for an Independence Day vignette. Red, white and blue fabric scraps make this no-sew banner a unique piece of rustic charm. A few items from the craft store and some scrapbook paper makes a cherry wreath you can hang all summer. A few ideas for celebrating Independence Day outdoors - decor, party decorations, and a reminder about flag etiquette. The perfect wreath for the front door - clear directions explain how to use a wire wreath frame and lengths of burlap to pull this together in time for the big day. A project the kids can do - imagine how fun a few of these jaunty windsocks would be, hanging from the porch or trees. I love this! Lengths of scrap material, denim and buttons make up a flag banner that will sway in the breeze. I can't wait to give this a try. 4. U.S. Flag Primer ~ Oh, Mrs. Tucker! If you decide to fly the flag for the occasion (or keep it up year 'round), it's a good idea to refresh the guidelines for displaying it appropriately. A cute and practical way to repurpose tin cans, these luminaries would add cute pools of candlelight that won't interfere with watching the fireworks. 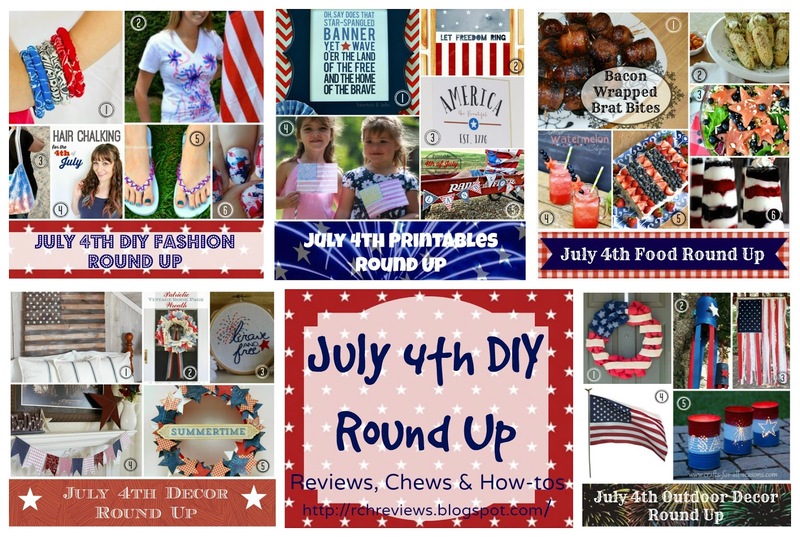 As time gets short for making more complicated projects, a few printables can help add just the right touch of red, white and blue. Lines from The National Anthem show off the red, white and blue. 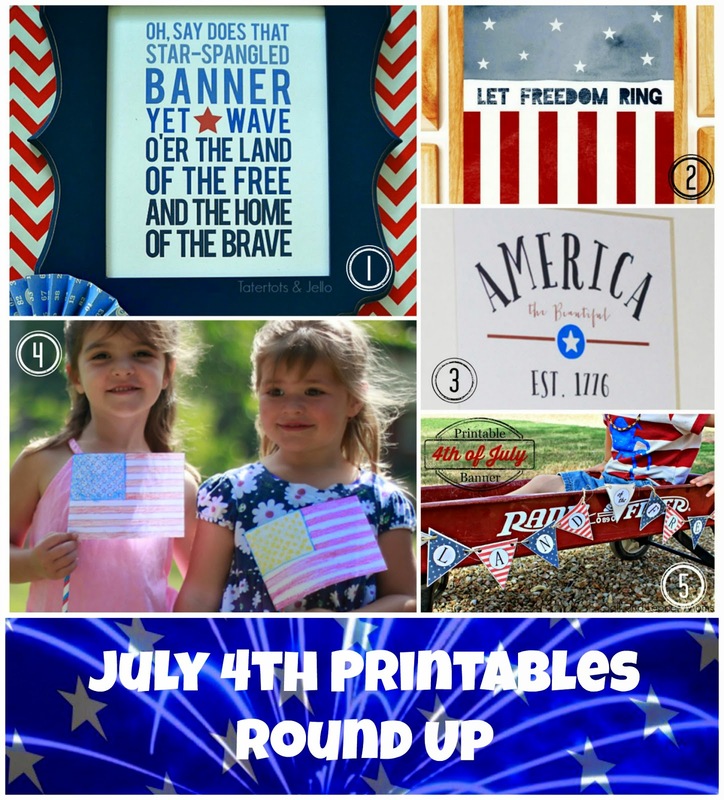 The printable comes in three different sizes, and the post includes instructions for creating an entire Independence Day vignette. A simple and colorful printable that would look great in a frame. Comes in either aqua and red, or navy and read. A simple colonial style motif, printed and put into a frame, can add a fast and subtle bit of Americana to your everyday decor. A coloring sheet that includes flag information and instructions for turning it into a waveable flag - have the kids make some up to take to a local parade. Long may it wave! Print and cut out these banner pieces and string them together to say "Land of the Free". Sweet touch! Once you've got your home decorated, what about yourself? 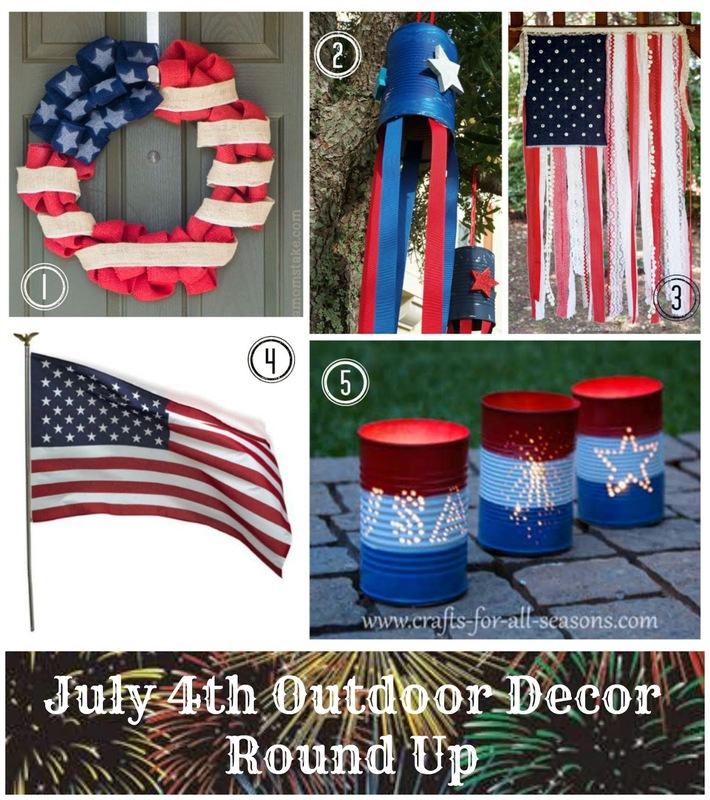 Here's some cute ideas for decking out for your barbecue or fireworks watching party. Bandanna wrapped tube bracelets create cute and easy accessories for the 4th of July. Markers and a plain T-shirt come together to create a fireworks. This would be a fun project for kids! Spatter painting over stencils is a wonderful technique used here to create a fashionable tote bag to carry treats and other necessities. Just for fun, try some temporary red, white and blue hair coloring. 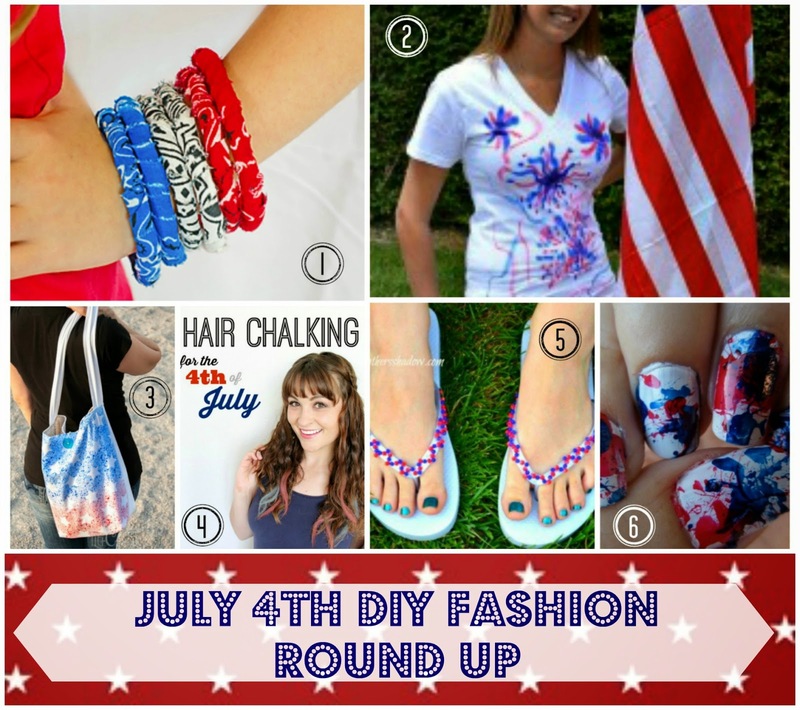 These instructions show you how to use chalk pastels to give your hair some patriotic flair. Clear instructions show how to use beading to decorate a plain pair of flip-flops. Not all the fireworks will be up in the sky - try this method to create some sizzle on your nails as well. Messy, but too cute! I grew up in Nebraska and for me corn on the cob is as All-American a part of the 4th of July as, well, Apple Pie. This take on it brings in some spice and citrus, making it a sophisticated and attractive addition to the Independence Day table. I love the way the husks are arranged to be attractive and accessible. This is as beautiful as it is delicious! Greens, blueberries, almonds and feta and watermelon star cutouts! The remaining watermelon is used to make a vinaigrette. I can't wait to try this one. Pureed watermelon makes or a refreshing (and healthy!) cold slushie drink. Perfect for the holiday and throughout summer. Graham crackers, layered with sweetened cream cheese, strawberries and blueberries, and chilled until ready to serve - are you drooling yet? I am! One of my oldest 'guilty pleasures' is a no-bake cheesecake, the one that was in every ad for cream cheese for a couple generations - this is a version without the crust. Delicious whipped cream cheese with lemon layered with cherry pie filling and blueberry pie filling. Nope, not one bit healthy - just delectable! The only downside I can see is that if you eat this, you may miss the fireworks, what with your eyes rolling back into your head in sheer bliss, and all. I hope you enjoyed this round up. Have a Happy Independence Day if you celebrate it, and enjoy your summer! ~ Link Party Palooza, My Favorite Things Saturday, No-Rules Weekend, Say G'Day Saturday, Serenity Saturday, Show & Tell Saturday, Showstopper Saturday, Super Saturday, Weekend Wind-Down. ~ Creative Collection, DIY Inspired, DIY Sunday Showcase, Happiness is Homemade, Nifty Thrifty Sunday, Share Your Creativity, Silver Pennies Sunday, Sunday Funday. ~ A Round Tuit, Amaze Me Monday, Clever Chicks Blog Hop, Frugal Crafty Home Blog Hop, Inspiration Monday, Making Your Home Sing Monday, Masterpiece Monday, Mix It Up Monday, Monday Funday, Monday's Reflection, Motivation Monday, Sweet Sharing Monday. ~ Brag About It, Create - Link - Inspire, Do Tell Tuesday, Good Tips Tuesday, Handmade Tuesdays, One Project at a Time, Show & Share, Take-a-Look Tuesday, Totally Talented Tuesdays, Treasure Box Tuesday, Tuesdays at Our Home, Two Cup Tuesday, You're Gonna Love It Tuesday. ~ Cast Party Wednesday, Centerpiece Wednesday, Happy Summer Link Up, Hit Me With Your Best Shot, Homemaking Link Up, Inspiration Board: Creative Party, Inspiration Exchange, Lovely Ladies Linky, Made By Me, Make - Bake - Create, Penny Pinching Party, Pretty Wednesday, Summer Family Fun Series, Wake Up Wednesdays, Wednesday Round Up, Wednesday Whatsits, Whatever Goes Wednesday, Whimsy Wednesday, Wicked Awesome Wednesday, Wonderful Wednesday, Wonderfully Creative Wednesdays, Work It Wednesday, Works For Me Wednesday, Wow Us Wednesdays, Your Whims Wednesday. ~ Creative Ways, Fabulously Frugal Thursday, Home & Garden Thursday, It's A Party, Moonlight & Mason Jars, Share Your Cup Thursday, Showcase Your Talent Thursday, Thrifty Thursday, Thursday Favorite Things. ~ Anything Goes, BFF Open House Link Party, City of Links, Fabulously Creative Friday, Feathered Nest Friday, Freedom Fridays, Fridays Unfolded, Handmade Hangout, Kitchen Fun & Crafty Friday,Party Bunch, Pinworthy Projects Party, Show and Tell Friday, TGIF Linky Party, Weekend Re-Treat, Weekend Social. Wishing you a great 4th of July!! These all look like great ideas!! Have a great 4th! Thanks for Linking up at My Favorite Things Saturday! Thansk SO MUCH for including my Patriotic Tote Bag! Woot! 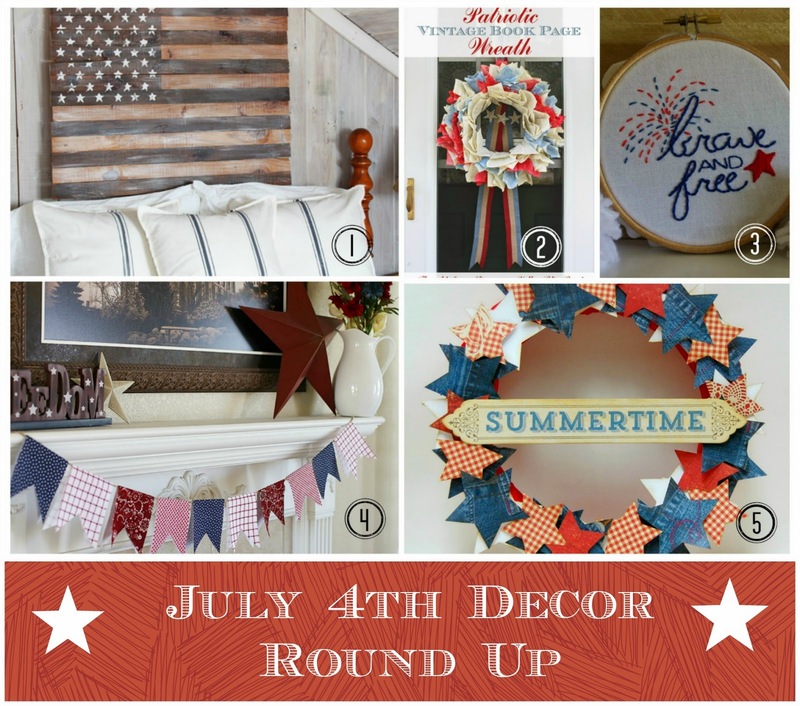 Fabulous roundup of Patriotic items! Thanks for sharing it with SYC.